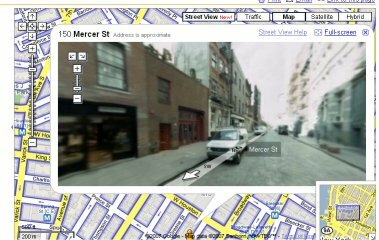 Google’s new Street View allows you to walk around the map with pictures to help you familiarise yourself with the surroundings. Drag the little yellow man around and click on him to see the picture of where you are. You can then pan around ‘walk’ down the street in the picture. When Mel Carson presented at SEOdays he spoke of this sort of technology being used as part of the new MSN. Seems they missed out. just when I thought Google couldn’t win me back their little yellow man shows me my Hotel in New York! Just found a few more stories on this new Google service. there are lots of cool ones out there.